Chika “Chica” moved from Tokyo, Japan to Vancouver, Canada in 2005 to train for Capoeira and Afro-Brazilian Dance at Axé Capoeira’s Vancouver Academy. She has traveled to Brazil, Kansas City, Phoenix, Seattle, Toronto, Calgary, Victoria to participate in workshops and perform in events. She has also performed at many local shows, demonstrations and festivals. Recently, on top of performing, her role has expanded to playing instruments for the shows as well. 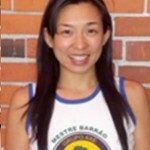 In the past, she has helped teach Capoeira Kids Classes in North Vancouver. Nowadays, she has been teaching the Afro-Brazilian Dance Class at the Axé Capoeira Vancouver Academy. Her skills as a BCRPA Registered Group Fitness Instructor is an amalgamation of her experience as a fitness instructor and snowboarding instructor in Japan as well as her performance experiences through Capoeira.